Hello bloggerverse! I cannot believe that it is already Sunday! I have so much in store for you in this post, including a recipe for shrimp alfredo that I made for Gareth this week. Delicious and easy shrimp alfredo for the busy foodie! 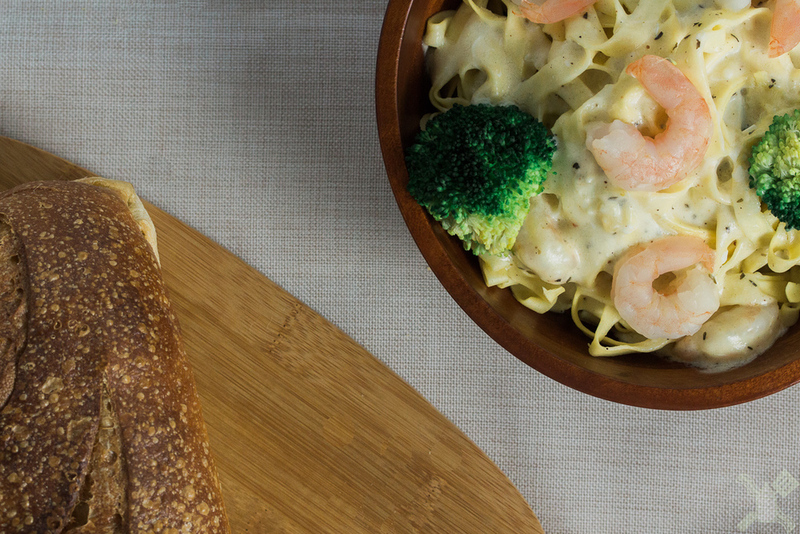 It’s not only delicious shrimp alfredo, but it only takes like 15 minutes to make. That’s right, you can have amazing, awesome, and quick shrimp alfredo faster than going to your favorite Italian spot to get it! Thank you for all of the comments and tweets about my Wednesday post, it is hard to put something out like that. It is hard to tell people that the person that they may see me as is not always the real person. I know that some of you may be going through the same thing and are fighting with yourself about it. Just know, that you are not alone at all. I did a test photoshoot with MealMade, an awesome paleo delivery service out of San Francisco, on Friday. I know that when ‘interviewing’ I should not try something new, but the plate they gave me was so colorful and beautiful, I had to shoot it in direct sunlight. I feel that it made the colors that much more vibrant and gorgeous. A beautiful Greek Salad by Sean at MealMade! They were so much fun to work with, as well. I’m not sure if I’ll get the job, but it was a great experience anyway, and now I have some new photos for my portfolio! I’m really hoping to get a few more good shoots so that I can get a new MacBook because this little man is failing me right now, especially when trying to use LightRoom and edit my photos. Speaking of Braedon, my little 8 month old, yes he’s 8 months old now, has been crawling and climbing on everything. I cannot believe that this time last year, I was pregnant, but not even really ready to see him! I’m so glad that I have him and Gareth right now, especially since Gareth is so keen on my dreams and helps every step of the way! I made my first attempt at brains this week. It was a fail, but I have a new game plan and my friend’s little boy is going to get a badass cake for his birthday! On to the Shrimp Alfredo recipe! You can't have Italian food without bread and wine, huh? Serve with your favorite pasta or bread! Share this post with all of your friend, I promise, they’ll love it! Follow me on Twitter, Instagram, Pinterest, and Google+, for more great photographs, recipes, blogging stuff, and well me!